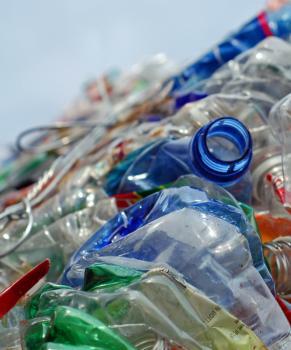 According to a post in WasteAdvantage magazine, the Plastic Pollution Coalition has published a new engineering estimate showing plummeting recycling rates for plastic in United States. Author Jan Dell, a consulting chemical engineer, used U.S. Environmental Protection Agency data and industry data to estimate the U.S. plastic recycling rate will sink from 9.1% in 2015 to 4.4% in 2018. Dell estimated the recycling rate could drop as low as 2.9% in 2019 if plastic waste import bans are adopted by more countries in Asia. The engineering estimate shows four factors contributing to the drop in recycling rates: 1. Plastic waste generation is increasing in the U.S. 2. Exports counted as recycled have cratered due to China’s ban. 3. Costs of recycling are increasing since many trucks are needed to collect the widely dispersed waste. 4. Plastic production expansion is keeping the prices of new plastics comparatively low. These factors work against the key premise that waste plastic will someday have sufficient value to drive reclaiming it rather than disposing of it. The United States ranks 20th on the list of countries contributing to plastic pollution in the ocean with an estimated 88 to 242 million pounds/year of plastic marine debris. The annual International Coastal Cleanup confirmed the evidence of plastic pollution on U.S. coasts in 2017 when more than 3.7 million pounds of trash, the majority of it plastic, was collected by 209,643 people on a single day. The global movement Break Free From Plastic provides aBrand Audit Toolkit for people participating in cleanups to audit and identify the brands and corporations responsible for plastic pollution. For more information, visit www.plasticpollutioncoalition.org. Jan Dell, PE, is a registered chemical engineer and author of The Last Beach Cleanup (to be published in 2019). She has worked with companies in diverse industries to implement sustainable business and climate resiliency practices in their operations, communities, and supply chains in more than 40 countries. Appointed by the White House Office of Science and Technology Policy, she was a member of the U.S. Federal Committee that led the 3rd National Climate Assessment from 2010 to 2014 and the Vice Chair of the U.S. Federal Advisory Committee on the Sustained National Climate Assessment in 2016-2017.